Second post for today. HERE is my first post! Thank you for joining us for the Christmas To Die For Challenge and we hope you will all join us again this week too. This week we are showcasing Concord & 9th Products. You don’t have to use them for the challenge but if you have them we would love to see them used. I love Concord and 9th products. They are very unique and innovative. My first stamp set from Concord and 9th is Brushed Blossoms stamp set. I not only LOVE the painted flowers and layers but the handwritten sentiments are gorgeous. Such a beautiful stamp set. 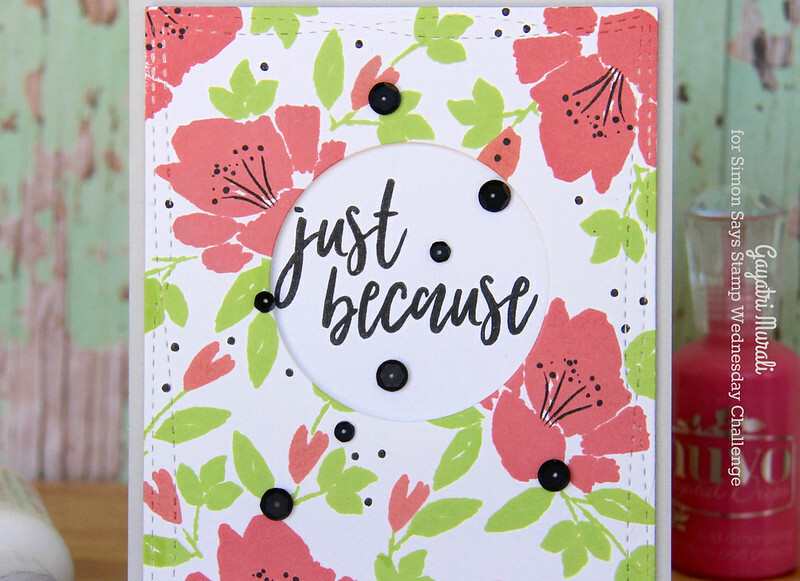 I decided to use the painted flower and leaves images from the stamp set and stamp a pretty background for my card. I used Fresh Peach ink from Hero Arts and Jelly Bean ink from Simon Says Stamp to stamp the flowers, buds and leaves. I used Versafine Black Onyx ink to add accents to the flowers and the background. I die cut the panel using the largest of the Wonky Stitched Rectangle die from MFT. The wonky stitches adds details. I die cut a circle in the top middle of the panel. I stamped the sentiment on a scrap white cardstock. I adhered the top panel on the sentiment panel using foam adhesives I adhered this panel on a Fog card base. To bring the black accent from the background and the black sentiment together, I added Onyx sequins. Beautifully done, Gayatri, you really brought this set to life! I love the fresh, spring-like colors and beautiful stamped images on your card! The black sequin accents bring everything together perfectly! Gorgeous card!